Associate Professor Guangming Zhang (ME/ISR) is participating in a five-year, $5.9 million National Institutes of Health grant, "Machinable Ceramics: Optimizing Performance and Properties." This grant is funded through NIH's National Institute of Dental and Craniofacial Research (NIDCR). 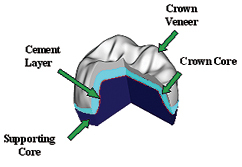 The program will develop fundamental understanding of damage initiation and accumulation in all-ceramic layered dental crowns as a function of materials, crown and tooth preparation design, and fabrication variables. The Machinable Ceramics Program is a continuation of seven years' worth of previous NIDCR funding and teamwork on monolithic ceramic crown materials, which has resulted in more than 70 publications, plus proceedings and abstracts. Four PhD dissertations have been based on the work. The strategic approach of the new work will be to move from flat layer structures with simple loads to crowns on real teeth with complex loads.